MJR Decorating Limited - Painter/Decorator based in Bramcote, Nottinghamshire. 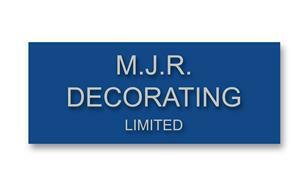 MJR DECORATING LIMITED was founded by Martin Richards. We are a family run business based in Bramcote, Nottingham serving clients all over the Nottingham area and are both Painting & Decorating Association and Nottinghamshire Trading Standards approved, ensuring that all work is carried out to the highest standard. MJR DECORATING LIMITED director Martin Richards (City & Guilds Qualified) has over 25 years of experience in all aspects of painting and decorating. Phone or email via our website: www.mjrdecorating.co.uk to agree a suitable time for a visit to your home or business to discuss your painting and decorating requirements. Advice can be given on colours, finishes, wall coverings and paint systems. After the initial visit a detailed quote will be sent to you, outlining the work that is to be carried out and the total cost (all work is carried out on a fixed price basis ensuring no hidden costs to our clients). All quotes are free and come with no obligation. If you are pleased with the quote, simply call us to arrange a convenient start date.